I began looking at sky, sea, earth, etc and realized that this could be close to being the most familiar and boring photographs one could make. Dumb images of dirt? Still photographs of water in a pool or lake? But my thought was to make them BIG, really large scale, say 10 feet high by 12 or more feet long; and I did make some like that for a show in Germany, where they were well received and collected. I continue to add to that body of work whenever something speaks to me. Here was a moment when the light was going, and a stream of buttermilk clouds slowly drifted into view, and I found myself in that frame of mind where studying the sky for a while was a purely pleasurable experience, and what could be a better stimulant than pleasure for making photographs? 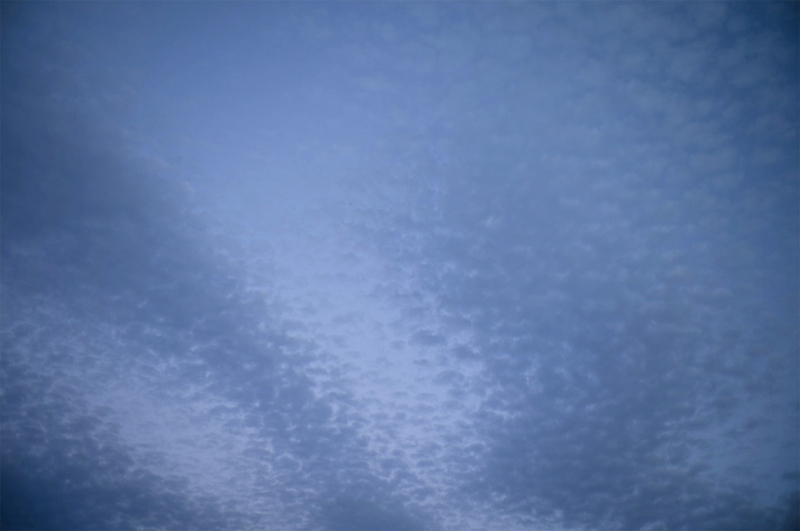 This entry was posted in Buttermilk sky, Elements and tagged Dusk, Elements, Light, sky on June 14, 2015 by joelmeyerowitz2014.